"The wine here is more than just chemistry, it's alchemy. It's an elixir"
On the Greek island of Santorini, there's a lot of talk about wine. Where ancient wineries abound, wine tours appear to be a dime a dozen. However, there is one tour that seems to stand out from the rest. American expat Phenix Gilbert shares her infectious passion for the island of Santorini through her food and wine tour company SAFOWI. Phenix has spent the past 18 years living in Santorini, and was one of the first to pioneer the wine tasting trend that has recently swept across the island. As we winded through the scenic backroads of Santorini, she explained, "Some tour guides come straight off the boat from Athens, not knowing a thing about Santorini. But I fell in love with this island 25 years ago, and I want to share that with others." Phenix's enthusiasm for the wine and gastronomy of Santorini is indeed contagious, for we found ourselves mesmerized by how the history of the island has shaped its culture of wine. But what makes the wine of Santorini so special? Undoubtedly, it's the distinct assyrtiko grape. This indigenous grape has essentially defied all odds by flourishing in a notably harsh environment. It has an explicit bite to it though; assyrtiko wines won't taste like any other whites you've tried. Its high minerality and sharp acidity set it apart from other Greek wines. Much like the island of Santorini, it has a unique personality . "It's a very special grape in a very special place", Phenix reveals. The first stop on our tour was a local vineyard, where Phenix explained how archaic techniques are still used to cultivate the grapes. The growing and cultivation methods may be complex and time-consuming, but tradition is decidedly the foundation of the island's winemaking. As demand for Santorini's wine increases, these family-owned wineries will most likely continue to utilize their antiquated processing methods. According to Phenix, Santorini's high-integrity winemakers refuse to sacrifice quality for quantity. After our cultivation crash course in the vineyard, we were taken to three different wineries scattered across the island. While there are an abundance of wineries in Santorini, Phenix hand-picked the best ones for us to visit. We chatted with the winery owners and learned about their histories and vinification processes while we sipped on their award-winning wines. At our final winery, we were treated to mouthwatering plates of meze, or Greek appetizers. Assyrtiko whites weren't the only shining stars of our wine tour. We also tasted another ancient Santorini specialty, Vinsanto. This decadent "holy" wine was traditionally used in orthodox churches around the world. At our first winery, we even saw 100-year-old barrels that were used to ship Vinsanto to Russia! 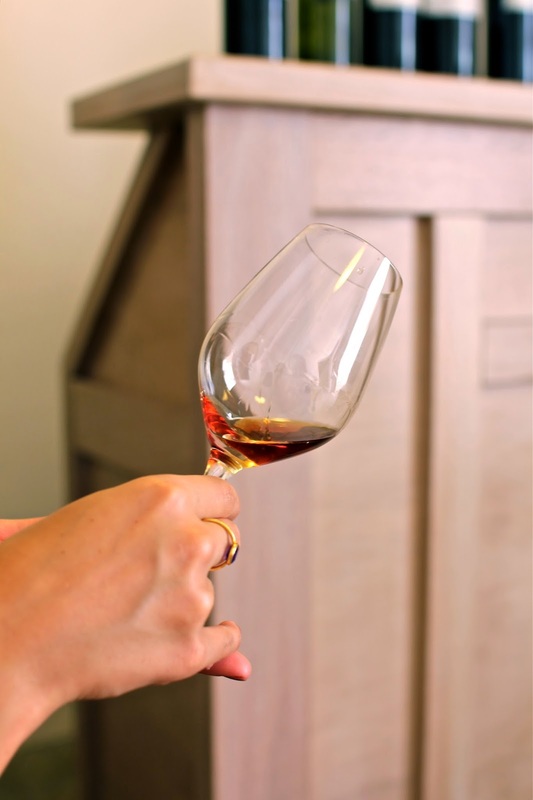 Although Vinsanto tastes like a rich, velvety dessert wine, surprisingly there are no sugars added. Vinsanto is made from late harvested grapes (predominately assyrtiko) that are dried in the sun for two weeks and then crushed - sometimes by foot! - before being fermented and aged in oak barrels. Our Semi-Private Wine Road tour lasted four hours, and private transportation was included to all three wineries and back. If we hadn't taken this tour, we wouldn't have been able to visit these particular wineries on our own. Not only were all three wineries spread out across the island, but taxis on Santorini are sparse and we wouldn't have been able to drive ourselves with the amount of wine we consumed. Taking a private tour is the easiest and most enjoyable way to sample the island's best wines, and I couldn't recommend this one enough. Overall, our tour gave us a comprehensive overview of the island's winemaking past and present. The extensive knowledge of our guide helped us to appreciate the complexity of Santorini's wines and enjoy the many flavors it has to offer. If you're interested in going beyond the typical tourist experience in Santorini, then wine tasting with SAFOWI is a must. Phenix from SAFOWI graciously invited us on her tour, but all opinions expressed are my own. You can find out more about SAFOWI and their unique food and wine tours here. Have you ever tried the wines of Santorini? What did you think? Where's the most interesting place you've been wine tasting? 21 comments on "Santorini One Sip at a Time: An Afternoon with SAFOWI"
Loved the wine in Santorini! I think I actually might have seen this tour out in one of the fields! How fun!! I really really want to go wine tasting - I have never been :( it is on my 101 in 1001 list though I love the quote - wine is not chemistry, but elixir! Wine is fabulous! I loved it too! I wasn't sure I would because it's SO different, but it grew on me fast! Vinsanto is a great dessert wine! It's rich and decadent, but not overwhelmingly sweet. Oooohmigod I absolutely love your redesign!! It looks AMAZING!! And you've now 100% convinced me I have to go to Greece this year. This post was the final straw. Amazing views and wine tastings? Im in. Thank you friend! You'd absolutely love Greece. Not only is it all-around stunning, but the food is unparalleled! When will you be back in Madrid? I MISS YOU! I actually know little to nothing about Greek wines! This tour sounds amazing. I love when a tour leader is passionate about her/his subject - it really shows. Our of all of the cool things that you guys did in Greece, this would be the one I'd most love to do. Getting whisked around a Greek island trying local wines? What an experience! Agreed! That's what makes tours really memorable. For me, the enthusiasm is always contagious! No it doesn't, don't worry! What's uncouth is the fact that I totally had to Google that word to figure out what it means. Hahaha. So really, you have more couth than I do! I fell in love with wine tastings when I was in South Africa! But your tour sounds amazing, it sounds so informative! I mean on top of tasting you get to learn about the grapes, etc. Sounds like the full package! I am dying to go wine tasting here in Germany to get a "taste" for it before venturing on to do it elsewhere. I would love to do it in Greece! This looks like an amazing experience! I like how you captured it with information, quotes and photos... I felt like I was on the tour too! I am very seriously shortlisting Santorini as a honeymoon locale for next year and I will definitely look into this tour while there. Experiencing the wine culture there seems like something not to be missed. Ooh wine tasting in Germany would be really fun! It was definitely a great thing to do in Greece because Greek wine is so different from what I'm used to, so learning about it helped me to appreciate it more. Thank you so much! The whole time I was in Oía, Santorini, I kept thinking about how it's the PERFECT honeymoon destination! Also SAFOWI sounds like a little toddler saying "safari." No better place to be a wino than in Europe, right? The wines in Santorini were really unique, so wine tasting there is an experience I'd definitely recommend! !